Doki. Doc. Dong. Doc Avelex. Baloy. RedRed. Tito Doc. 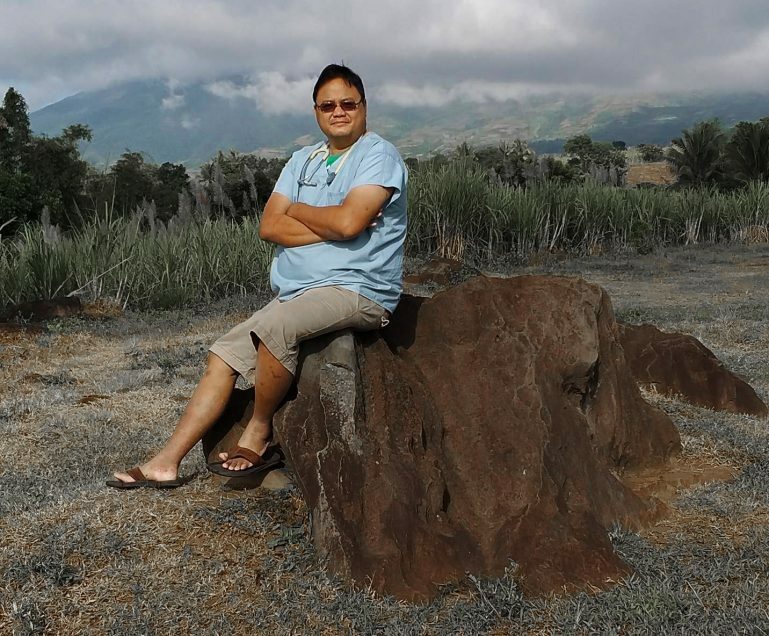 We know Dr. Avelex Salinas Amor through his many names at various stages of his life. We first knew him as Avelex, named after his maternal grandfather, Avelino Salinas and his paternal grandfather, Alexander Amor. It was a name selected to ensure that both grandfathers were equally happy since he was their first apo. It also meant that Avelex was equally spoiled. But to his parents, who met in the barricades of Manila protesting against the Marcos Dictatorship in the 1970s, he was, and will always be, RedRed. Red, was an impish boy, very much like his dad as a kid. He had the run of both family houses where all his aunts and uncles also spoiled him. Except for me; I loved him so much that I disciplined him equally as hard. We also knew him as Avelex or Lex as he and his childhood friends went through kindergarten, elementary, and high school at Silliman University, followed by college at the University of the Philippines at Los Banos. Our family’s abiding love for Silliman became, not surprisingly, also his abiding love. Avelex was a child of this church, this university community. 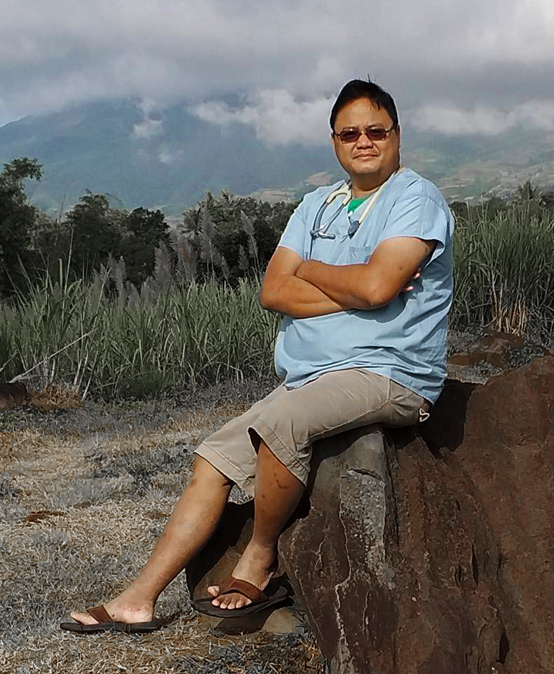 We knew Avelex as a man who eventually became a doctor thanks to thousands of hens who laid an egg a day so that he can finish his medical degree from the Cebu Institute of Medicine. His med-ical degree was literally earned one egg at a time. To some extent his fellow medical students also owed their passing grades to these hens. Avelex freely shared his notes and encouraged classmates who lagged behind to finish their medical stud-ies. Eventually, Avelex earned diplomates in occupational health and diabetes. Those diplomates were earned with the help of my brother’s underground army —an army of worms which produced earth castings for the superior organic fertilizer that his parents, Alex and Boots, still produce. We first knew him as Doc when he chose to open a small clinic and a wellness club in the public market of Dumaguete. He wanted to be at SM — Sa Mercado — and not in some fancy mall or at a medical center. Through the wellness clinic, he tackled the epidemic of diabetes that is plaguing our country. The SU Cafeteria staff knew him as Doc Avelex who ministered to their health while working as a staff doctor at SUMC. He was in awe as a doctor working at the Marina Clinic. In awe because he was working on — and learning — preventive health care from his idol, Dr. Fe Sycip Wale. We finally knew him as Doki — the people’s doctor. He was the doctor who ran up bills in boticas in Canlaon, Bindoy, Santa Catalina, Siquijor, and elsewhere Avelex was assigned. He borrowed from these pharmacies so his patients could buy the medicines they needed and when the medi-cines in the government hospitals provided were of poor quality. Chalk, he called those sub-par medicines. Doki went into debt to ensure that his patients received the medicines they needed. Doki was a strict doctor who did not tolerate corruption. To him the health of his patients was par-amount. To him, providing medical care to rural Filipinos and poor people was paramount. He could have immigrated to the US and become wealthy. But money did not drive him — service to the people was his muse. Avelex eventually started a dormitory in the house he inherited from our aunts. The idea was that the income from his boarding house would subsidize his medical work. It worked — up to a certain extent. Most of his boarders are government scholars whose allowances are often late. Yet he con-tinues to house and feed them until their allowances arrived. We know Dodong Doc as a boarding house owner who also produced countless college graduates — notably a chemist now in Korea pursuing her masters degree and a geologist whose success he planned to celebrate before Avelex was assassinated last Tuesday, Nov. 20. What many people do not know is that the stubborn streak in him, the drive to always do what is right and fair for the people, comes from our ancestors — Don Diego de la Vina and his wife, Do-na Sisang Geopano of Vallehermoso and Don Pelagio Villegas of Guihulngan —revolutionaries who fought to liberate Negros from the Spanish colonizers. This dedication has continued through our generation and was reinforced by his fathers and mothers of the First Quarter Storm Genera-tion. We do not know who killed Avelex, but more importantly, the people who ordered his killing. What we do firmly know is that God’s arc of justice will eventually bend to expose them. Let this be a warning to them: We are not cowered; we will fight back. You cannot kill your way out of in-justice. You cannot assassinate your way out of the corruption that deprives our people of the healthcare that they deserve. We will fight back by helping train more doctors to work with poor Filipinos, especially in the rural areas. Our families and our friends have agreed to establish the Dr. Avelex S. Amor Fellowship in Medicine at Silliman University. Helping train new doctors is our response to the senseless violence that ended Doki’s life. Avelex, always my favorite eldest nephew, we bid you adieu —not good bye — because we will meet again in the life after death. Thanks be to God for Dr. Avelex S. Amor, the People’s Doctor.